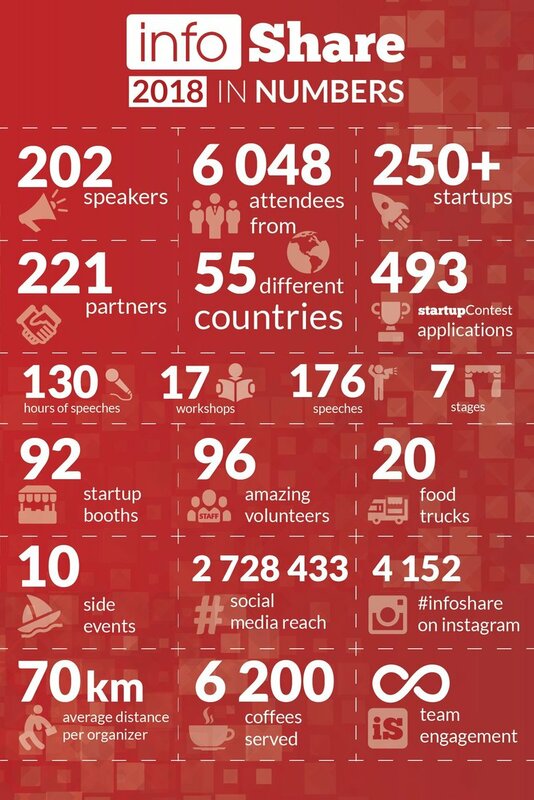 Over 6 000 participants from 55 countries, over 250 startups and 202 experts from around the world, who shared their knowledge on 7 stages during the two days of the event. We summarized the 12th edition of infoShare, the biggest technology conference in CEE. Thank you for being with us. What was the conference about? infoShare is a two-day festival of new technologies, which found a permanent place in calendars of participants from around the world. This year, Gdańsk was visited by 6 048 people from 55 countries. The variety of stages, lectures and invited guests ensured access to knowledge for everyone – from specialists and startups, through owners of medium and large enterprises, to investors looking for solutions with the potential to generate high profits. We hosted 202 speakers with 176 speeches on 7 stages. Their subjects were diverse. The audience at the Inspire stage learned how to build a personal brand, how new technologies will change the market of innovation and investment in Poland, and what changes will be brought by the blockchain technology that is growing in popularity. People attending three technological stages gained knowledge in programming, website and application design, big data, cloud solutions and the most popular technologies such as blockchain, AI, and IoT. Startup Stage was two days of presenting the best ideas that were selected from 493 applications for Startup Contest. The main prize, 20,000 EUR, was awarded to ThinAir Water, the author of a solution to acquire and treat water from the atmosphere. 92 startups had their booths in the exhibition space, and almost 1,300 dedicated meetings with investors took place as part of the Speed Dating concept. The art of presentation, building a personal brand, e-mail marketing and the use of social channels were the main topics addressed at Marketing Stage. On the second day, Marketing Stage turned into the Leaders Event, where innovation, startups and the European investment market were discussed. The conference part was complemented by attractive side events this year. Together with us, you had fun during Before Party in Sopot and Great Networking Party with a live concert in Gdańsk's Old Maneż. The yearly galleons cruise during the sunset ended this year in the Brewery Port in Gdynia, and on a trip along the coast of the Gulf of Gdansk, we sailed on Onyx in an "intimate" - 500-person - group. infoShare systematically gathers more and more participants every year. Our ambitions are large and - as the 12th edition proves – it's possible to implement. Organizing events on a European scale in Poland is possible. This is confirmed by the presence of international experts and startups, which came to Gdańsk from all over Europe to take part in the Startup Contest - summarizes Grzegorz Borowski, our CEO. The next infoShare record. The conference attracted over 6 000 participants to Gdańsk! The 7000th attendee have just registered for infoShare 2018!